We, Frank Terkhorn and myself, had about 200 yards of George’s Creek to traverse before dropping into Crooked Creek; that was of course after inflating our Creek Company float boats and organizing a days’ worth of flies, rods, cameras and various pieces of equipment one might need while spending an entire day on the water. Dad would turn right onto highway 62 and go about five miles towards the town of Yellville (home to the Arkansas turkey calling championship) then west towards the Kelly Access where we would meet him several hours later. Crooked Creek was a smallish, clear stream of water that I had fished a couple years back while there was too much generation going on at Bull Shoals and Norfork. My memories were catching a few smallmouth, a couple of which were pretty nice. Today the small stream was way up…in fact it was running at about 700 CFS when it should’ve been somewhere below 100; bottom line is that the water was both up and stained, perfect conditions for catching a large fish. We had only floated about a ¼ mile when I made a cast under an overhanging limb and right next to the bank. I had hopped out of the seat on my Voyager and was fishing just above the first good white water we had come to. I felt a pop on the other end and quickly strip set my Rio 6-weight, sink-tip fly line. I scanned the water for my yellow fly, from behind the fly I could see a large figure appear and accelerate to once again attack the offering…one more time with a strip set but alas I had missed this good fish. At the time I thought this was a very good sign; a full two hours later and neither of us had yet to catch a fish! To say the least we were both disappointed. I have learned that smallies tend to be a real ‘gentlemen’s’ fish…they just don’t like to get going too early in the morning, so hope wasn’t lost because the water and the structure of the creek was too productive looking. Never have I floated a waterway that just looked so good. Every few feet was another rock, log or grassy patch that just had to have a big pig of a smallmouth lurking in its area? As the sun moved directly overhead I started to wonder…then a tug, a strip set and I had landed my first smallie of the day. Frank had also collected a fish; while they were both small, mine was only about 10 inches, a fish was a fish and maybe, just maybe, we had taken the stink off the water. It is pretty tough to be unhappy while floating down a creek that has wildlife abounding all around…oh, and did I mention that on our entire float we only saw one person (that was dad when we finally arrived at our pick-up point). Fish by fish, both Frank and I started to peck away at the creek and as was formulated earlier…these ‘sleepy’ fish began to wake up and our day made a big turn towards the positive. There before me was another one of those awesome looking boulders and my yellow streamer kur-plopped just upstream from it…before I could even tighten up on my line I felt tension. For about 4 seconds I was engaged with a very nice fish…clearly bigger that anything I had caught thus far…the fly pulled loose. While disappointed I once again reloaded my rod and poked my fly beside the next boulder downstream and this time a hook-up ensued. With water flowing at 700 CFS it doesn’t take a big fish to really put a bend on a rod; when the fish is a fat 15 incher…the rod will really snap to attention. With experience you learn how to navigate the rushing water, boat, rocks, etc…and in under a minute I was happily pulling out my camera and taking a photo of healthy smallmouth bass. Crooked Creek was and will always be one of my favorite destinations. Our day upon this un-sung waterway was special for many reasons but I have to come back to the fact that seldom do you get to spend an entire day out in nature, let alone in the Ozarks, with one of your best buddies, catch a few nice fish…and not see another human. We had a long day but clearly both Frank and I would’ve turned right around the next day and floated the creek all over again. Truth is that I can’t wait to get back to this north-central region of Arkansas. 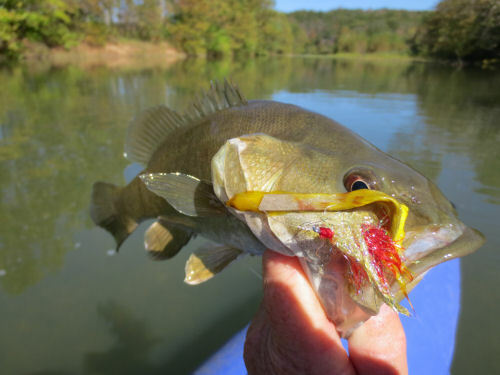 The amount of water to fish has to be second to none…aside from the fact that you can catch four different species of trout, the ever-present smallmouth bass seem to be lurking in just about any piece of water that contains a few feet of flowing water. 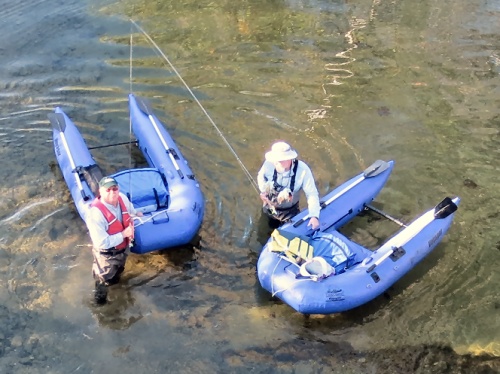 Our week would eventually come to an end and we would once again make our way back home…but not before driving just under 2100 miles and fishing, floating or wading on six different creeks/rivers. It was a week that saw us survive several inches of rain as well as an F-1 tornado that popped up just a few miles from our campground. Late in the week both the fishing and our weather improved and our time fly-fishing for various species turned out to be quite spectacular; the three of us shared meals together and just had an enjoyable time Enjoying the Great Outdoors.